This is the perfect book for kids who love animals. On the big, sturdy board pages, they’ll discover bright, bold photographs of all different kinds of animals, from pets to farm animals to birds. Each has their name written underneath, so that children can learn what they’re called, build their animal vocabulary, and start to develop word and picture association. 1. Great book for language development. The animals are sorted into groups including Baby Animals, Pets, On the Farm, Birds, and At the Zoo. A great book for playing “Where’s the…” and “What’s that?” pointing games. 2. Clear, beautiful photos. Each animal photograph is also placed against a solid colored background so that the image really stands out. 3. Unlike other animal photography books, the pages are not an animal collage with all the animals mixed in together. Each animal is shown in a square or rectangle with the name of the animals printed in lowercase underneath. Babies and Young toddlers are often confused by jumbled images and prefer the simplicity of how the animals are presented in this book. 4. The book also has a rhyming, interactive text. For example on the zoo page it says, “I’m hard to see when I’m out in the snow. Who am I? (polar bear) I carry a trunk wherever I go. Who am I? (elephant). My toddler, like most, is highly attracted to rhyming text. I got this for my one year old twins, and they simply love it! 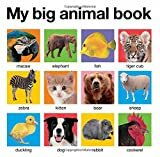 They enjoy looking at the bright and colorful photographs of all the animals and this book enables me to make it a fun way of teaching them what different animals look like and the sounds they make. One of my twins always wails when I am finished and I close the book — she simply wants to look at the book some more! I highly recommend this book for parents with young children.